Toyota provided 35 three-wheel Toyota i-Road EVs, pictured, and 35 four-wheel Toyota Auto Body COMS EVs for the car-sharing scheme in Grenoble. GRENOBLE, France -- Toyota launched a car-sharing service in France Oct. 1 that may be expanded to other cities after a three-year trial. Travelers in Grenoble can hire one of 70 Toyota electric vehicles parked around the city for short journeys after reserving the vehicle on a smart phone app. Toyota is joining automakers such as Renault, PSA/Peugeot-Citroen, BMW, Daimler and Ford Motor in promoting car-sharing. Toyota Chairman Takeshi Uchiyamada said the Grenoble pilot project will help to encourage the use of electric vehicles in cities. "I have a very strong personal intention to fill the cities with electric vehicles worldwide. We expect to see major advancements by 2020," Uchiyamada said at a press event here. Toyota, which is piloting a similar project in its home town of Toyota City in Japan, considers that electric vehicles are especially suited to short-distance, urban journeys while hybrids, plug-in hybrids and fuel cell vehicles are more practical for longer trips. Uchiyamada said Toyota could offer its EVs to mobility services like the one initiated in Grenoble this month around the world. 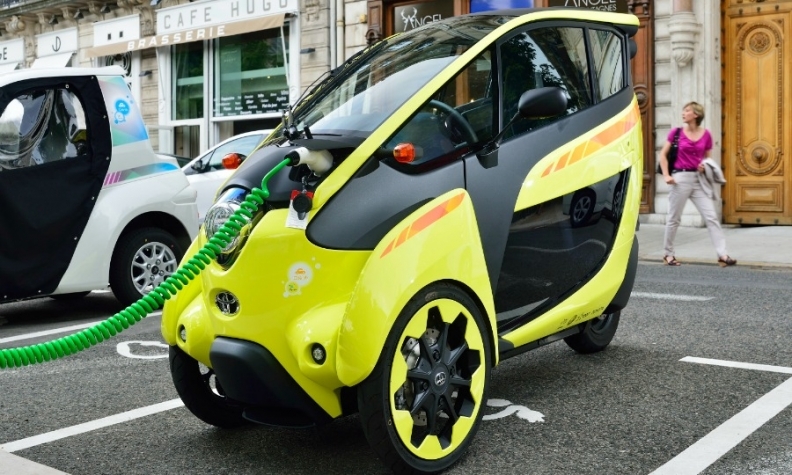 Toyota’s partners for the Grenoble car-share program include the local city authority and public transport provider, along with the French electricity company EDF. Toyota has provided 35 three-wheel Toyota i-Road and 35 four-wheel Toyota Auto Body COMS for the project. Toyota Europe President Didier Leroy said the project is an extension of public transportation. Customers might, for example, use the car-sharing website to reserve a Toyota i-ROAD at the Grenoble train station, leave the car at one of the drop-off locations and then take a tram back to the train station. A main feature of the service is its low price: city residents can rent a Toyota EV for as little as 5 euros an hour or for 17 euros for 4 hours.